Alcaire Castle is a castle in northwestern Stormhaven. It is ruled over by Duke Nathaniel and is where he and his wife, Duchess Lakana, make their home. Many Knights of the Flame also reside here as the protectors of the Duke and Duchess. The Dukes of Alcaire have been ruling over western Stormhaven since the late First Era. Just outside of the walls, a few buildings can be found surrounded by the Redguard army camp. 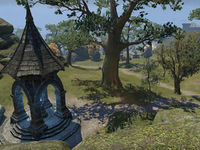 To the complete south, some Fighters Guild members can be found camping by the castle stables as well as a Mages Guild camp. On the south side within the walls is the inn with the castle itself sitting just north of it. The market is located directly to the east of the castle. With the arrival of a large Redguard force, many residents of the castle and the surrounding area fear an attack by King Fahara'jad's men and an end to the Daggerfall Covenant. Alcaire Castle Objective: Resolve the Military Standoff that threatens the Covenant. Army at the Gates: Derive the true purpose of the Alik'r army at Alcaire Castle. 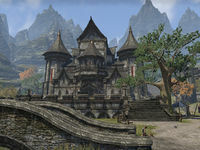 Two Sides to Every Coin: Help the Duchess deliver her message from the castle to the Alik'r camp. Life of the Duchess: Take action to protect Duchess Lakana of Alcaire. The Safety of the Kingdom: Investigate the assassination attempts at Alcaire Castle. To Alcaire Castle: Investigate rumors of discourse at Alcaire Castle. Castle Charm Challenge: Celebrate the New Life Festival with the Bretons of Alcaire. 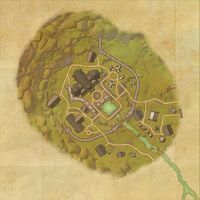 Tracking Sir Hughes: Track down Sir Hughes at Firebrand Keep. Alcaire Castle Wayshrine is located to the east of the castle, just south of Newgate. This page was last modified on 19 November 2018, at 05:35.